The police at Nyinahini have retrieved three bodies from an uncompleted structure at Kapem in the Atwima Mponua District of Ashanti. The first body was discovered by some labourers who were clearing a bush in the uncompleted building. Accra Hearts of Oak beat arch-rivals Kumasi Asante Kotoko by a resounding 3-1 to send a two-goal cushion into the second leg of the ‘Ghana: 60 Years On’ President's Cup in Kumasi. Hearts profited from two howlers by Kotoko’s young goalie Felix Annan for a deserved win in yesterday’s clash at the Accra Sports Stadium. Angel Group of Companies has reacted to the Food and Drugs Authority (FDA) directive asking them to recall Adonko Bitters, an alcoholic beverage from the market. According to the company, it was surprising that the FDA which approved the product would turn around and question its quality and safety mechanism. The United States national team will play Ghana on July 1 in East Hartford, Connecticut, to prepare for the CONCACAF Gold Cup, U.S. Soccer confirmed on Monday. As reported by ESPN FC last month, the game at Rentschler Field will serve as a tune-up ahead of group-stage games against Panama, Martinique, and Nicaragua. Zonal defending champions, Ampem Darkoa and Hasaacas Ladies began their campaign in this year’s National Women’s League (NWL) with emphatic wins as the competition kicked off over the weekend. 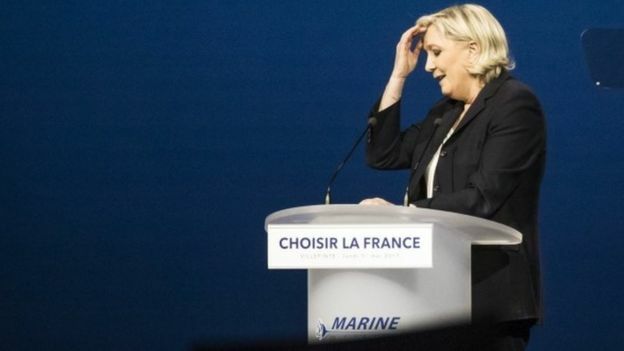 French presidential candidate Marine Le Pen has been accused of plagiarising defeated rival François Fillon in a speech she delivered on Monday. Several sections of her speech in Villepinte, north of Paris, appear to repeat almost word-for-word comments Mr Fillon made in an address on 15 April. The Integrated Social Development Centre (ISODEC) has called on the government to take pragmatic measures to deal with illicit financial flows (IFFs) usually carried out by multinational companies and individuals against developing countries. HFC Bank’s new Board Chairman, Mr. Charles William Zwennes together with the Managing Director, Mr. Robert Lennard Le Hunte and the President of Republic Financial Holdings Limited (RFHL), Mr. Nigel Mark Baptiste paid a courtesy call on President Nana Addo Dankwa Akufo-Addo last Thursday at the Flagstaff House. The distribution of insecticide-treated mosquito nets (ITNs) to pregnant women, lactating mothers and parents of children under five years of age continues to positively support other malaria control measures. This has potentially been added to the core package of the World Health Organisation-recommended measures for malaria prevention, in support of a vast shift in the malaria elimination agenda on the continent. Abuja – Nigeria's Federal Government says it will soon invite Anthony Joshua, the newly crowned unified World Heavyweight Boxing Champion to the country. The Minister of Information and Culture, Alhaji Lai Mohammed disclosed this in a statement issued on Tuesday in Lagos. The money market in the Volta Region is gradually growing and attracting attention, but with caution to operators to hurry slowly by desisting from duping hardworking people of their savings and investments. The Association of Oil Marketing Companies (OMC) has expressed concern about activities of ‘black marketers’ who have been smuggling fuel into Ghana. Consequently, the association has given a 48-hour ultimatum to government, to bring the activities of the black marketers to a halt. Government will only take a second look at the newly introduced administrative measures in the tax exemption system, after it concludes a comprehensive review of the entire regime, a Deputy Minister of Finance, Mr Kwaku Kwateng, has said. The Assistant headmaster in charge of administration at the Okomfo Anokye Senior Higher School (SHS) at Wiamoase in the Ashanti region, has been shot dead by unknown assailants. The 52-year-old James Agyei, was reportedly killed between Aboabogya and Adubinso in the Afigya Kwabre District of Ashanti on Sunday. Petrosol, an oil marketing company, has organised a training programme for its staff on best industry practices, as well as customer service management skills. Voltic (GH) Limited has organised a day’s training on daily book keeping, small and medium enterprises (SME) insurance policies and pensions fund options available to the informal sector for 50 of its clients in the Accra District to climax its financial literacy month. Caitlyn Jenner told an audience Tuesday night that she would consider running for public office during an interview promoting her new book. Jenner, a Republican who came out as transgender in 2015 and says she voted for Donald Trump, told a crowd at the 92nd Street Y community center in New York City that over the next year or two, she will look at where she thinks she could be more effective: On the inside of government or from the outside working with her foundation. “Say the truth in the morning and you would be free in the afternoon” — Author It is a truism that many people have come to a realisation that air travel remains the fastest means of traveling to any destination in the world.